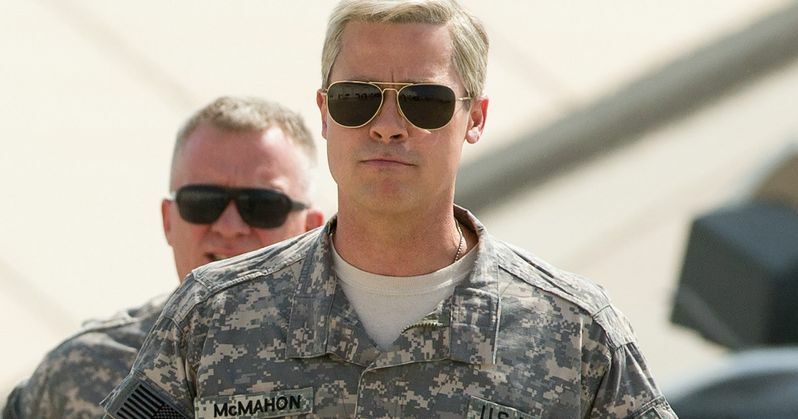 Netflix presents the brand new trailer for the highly-anticipated feature film War Machine, starring Brad Pitt, Emory Cohen, Topher Grace, Anthony Michael Hall, Will Poulter, Lakeith Stanfield, Meg Tilly, Tilda Swinton, and Sir Ben Kingsley. A film for our times, this absurdist tale and pitch-black war story takes on hot-shot General Glenn McMahon, a man caught up in a modern war machine that keeps on churning, seemingly to no end. War Machine is the latest feature film from acclaimed director David Michod (Animal Kingdom). It will be released globally on Netflix on May 26, 2017. In a film for our times, writer-director David Michod (Animal Kingdom) recreates a U.S. General's roller-coaster rise and fall as part reality, part savage parody - raising the specter of just where the line between them lies today. His is an anti-establishment, pro-soldier exploration in the form of an absurdist war story of a born leader's ultra-confident march right into the dark heart of folly. At the story's core is Brad Pitt's sly take on a successful, charismatic four-star general who leapt in like a rock star to command NATO forces in Afghanistan, only to be taken down by his own hubris and a journalist's no-holds-barred expose. War Machine addresses the debt we owe to soldiers to question the purposes to which they are being directed. The Netflix original film is inspired by the book The Operators: The Wild & Terrifying Inside Story of America's War in Afghanistan by the late journalist Michael Hastings. Joining Pitt in War Machine is a highly decorated cast including Emory Cohen, RJ Cyler, Topher Grace, Anthony Michael Hall, Anthony Hayes, John Magaro, Scoot McNairy, Will Poulter, Alan Ruck, Lakeith Stanfield, Josh Stewart, Meg Tilly, Tilda Swinton and Sir Ben Kingsley. Brad Pitt, Dede Gardner, Jeremy Kleiner, Ted Sarandos and Ian Bryce serve as producers. James W. Skotchdopole, Pauline Fischer, Sarah Bowen and Sarah Esberg serve as executive producers. The film will be released on Netflix on May 26, 2017. War Machine promises to be one of this summer's biggest hits, and if you subscribe to Netflix, you won't even have to leave the comfort of your home to battle the crowds at the multiplex. War Machine isn't the only exciting release coming to Netflix in the months ahead. At a recent multi-show slate event in Berlin centered around Netflix's commitment to bringing the best in entertainment to Europe as one of the top producers of high quality European content, Netflix released details and assets for new and returning original series, films, documentaries and more. There, Netflix not only promoted their new movie War Machine, they also showed off the official trailer for 13 Reasons Why, the date announcement for GLOW, and the first look teaser for the new original series Mindhunter. Set in 1985 Los Angeles, GLOW follows Ruth Wilder (Alison Brie), a struggling out-of-work actress as she auditions for, trains and eventually makes the first-ever women's wrestling TV show. GLOW is executive produced by Orange is the New Black's Jenji Kohan and Tara Herrmann and created by Liz Flahive (Homeland, Nurse Jackie) and Carly Mensch (Nurse Jackie, Orange Is The New Black). 13 Reasons Why is the latest Young Adult drama from Netflix. It follows teenager Clay Jensen as he returns from school to find a mysterious box on his porch. Inside he discovers tapes recorded by Hannah Baker, his classmate and crush, who has tragically committed suicide. Through Hannah and Clay's dual narratives, 13 Reasons Why weaves an intricate and heart wrenching tale of teenage life. Based on the best-selling book the series is created by Pulitzer Prize winner Brian Yorkey (Next to Normal) with episodes directed by Academy Award winner Tom McCarthy (Spotlight). New original series Mindhunter will premiere globally on Netflix in October. It features Jonathan Groff (Looking), Holt McCallanay (Sully), Anna Torv (Fringe) and Hannah Gross (Unless). The series is directed by David Fincher (Gone Girl, The Social Network, Zodiac), Asif Kapadia (Amy, Senna), Tobias Lindholm (A War, A Hijacking) and Andrew Douglas (The Amityville Horror, U Want Me 2 Kill Him?). Fincher, Joshua Donen (Gone Girl, The Quick and the Dead) Charlize Theron (Girlboss, Hatfields & McCoys) and Cean Chaffin (Gone Girl, Fight Club) are Executive Producers. But that's not why you came here. You came to see Brad Pitt in his first Netflix original movie. You can check out the second trailer here. This promises to be one heck of a summer on Netflix.